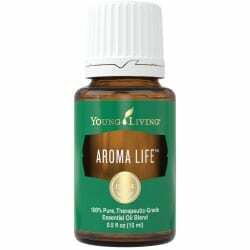 Aroma Life Oil Blend contains Marjoram and Ylang Ylang essential oils to energize your spirit and create a sense of connection. Aroma Life oil blend was formulated after years of research for both physical and emotional health. For that reason, insist on them. This Oil Blend combines the harmonizing effects of ylang-ylang. As well as the known powerhouses cypress, helichrysum, and marjoram. Pulsing with life, this vibrant blend energizes your life force. For that reason, it is best applied over heart energy, front and/or back. Energize your spirit with this blend! Personally, I love the aroma of this blend. I really enjoy just inhaling it from the bottle. Furthermore, I enjoy wearing it as a perfume. I use this every day, applied to the carotid arteries on the neck. For aromatic use. Apply over the heart or on the feet. Also, on the hand under the ring finger, and above the elbow. Dilute with V-6™ Enhanced Vegetable Oil Complex for a body massage. Possible skin sensitivity. If pregnant or under a doctor’s care, consult your physician. Cypress (Cupressus sempervirens), marjoram (Origanum majorana), Helichrysum (Helichrysum italicum), and ylang-ylang (Cananga odorata) in a base of sesame seed oil. Helichrysum – essential oil reference credit this oil with improving circulation, and reducing blood viscosity. Ylang Ylang – is developing a history of being used to help balance heart function. Marjoram – is known for its ability to relieve muscle spasms. Secondly, said to calm nervous tension and to help regenerate smooth muscle tissue. Cypress – is known for circulation above all else. Our story started more than 20 years ago with a simple, home-built essential oil distillery. Today, our farms and community span the globe. Because of our proven commitment to providing nature’s best, millions trust us to deliver superior essential oils. Display all Young Living Oil Blends online from GF-Oils. Review here.